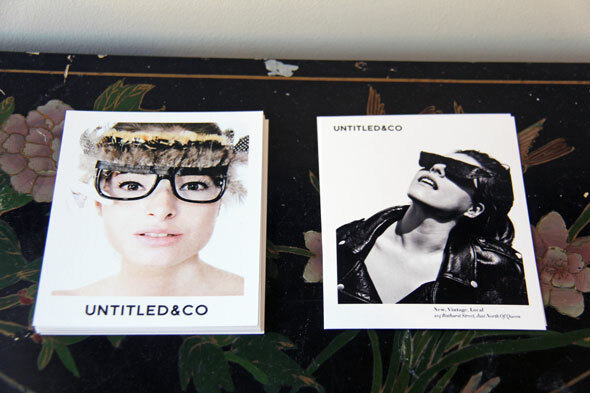 Untitled and Co. exists on a mostly unassuming stretch just north of Queen West , and attempts to inject a touch of je ne sais quoi to an immediate area known mostly for Cherry Colas . In operation for about 5 weeks, the store was initially fated to set down around Regent Park--an area which owner Cameron Wilson proclaims to be the next Queen West--but between storefronts that were too expensive, too small, and too out-of-the-way, he discovered the Goldilocks median on Bathurst. The space is perfectly sized for the frequently-replenished stock, allowing for the array of pieces culled from Wilson's apartment-the typewriter, the wooden fixtures, the wealth of golden, plastic dinosaurs (of which there are earrings, as well)--to shine through. The price point is kept low, with the most expensive piece ringing at $150, and a general range between $25 and $40. 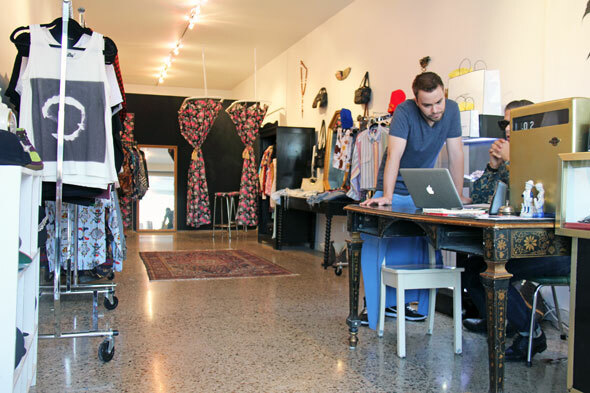 The brainchild of 22-year-old Wilson--who wears a blouse printed with gold chains and dollar signs, and heavy shades on my visit--the store is managed by friend Chloe Sam-McGrath, and created with many thanks to his Mom (that's right). 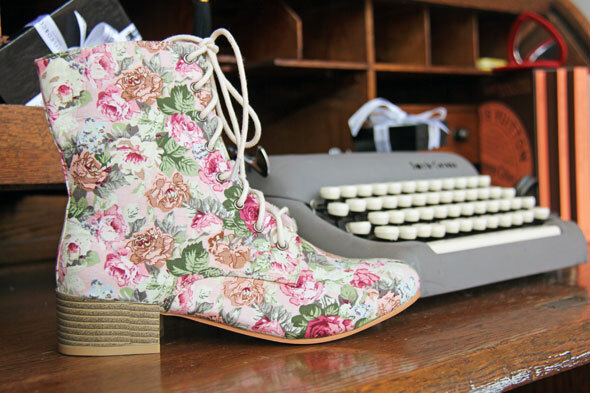 It boasts a bold and eclectic mix of vintage, new pieces from local and international brands (most of which don't even seem to have a website), and Wilson's own line of new and reworked vintage, Untitled and Co.
Wilson says his mandate with the store is to fight mass consumerism and promote individuality. He left high school for Milan to pursue a full-time career in modeling, and he's returned with a lot of fashion knowledge. 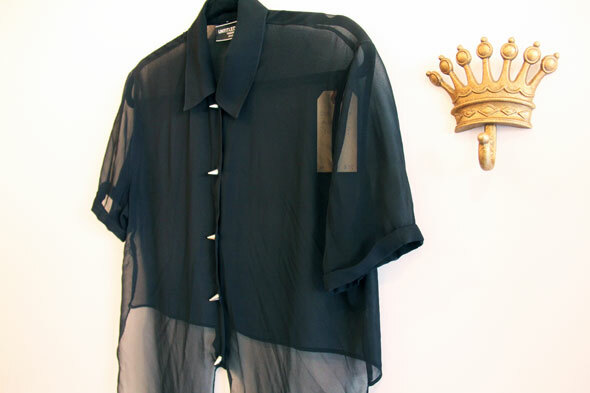 The store is distractingly filled with all manner of prints, textures, fabrics and hues, and yet despite this, I have no trouble zeroing in on a beautiful sheer black tee, reworked by Untitled and Co. with studded buttons. These moments of restraint are few and far between, but well-executed. In the front of the store, you'll find a small rack of new men's and unisex clothing--from Sglow in the Dark, an international exclusive to Untitled and hand-made and digitally printed tank tops ($40) in Mexico City and the risque, pseudo-pornographic printed tees ($25) of Body by Jay. 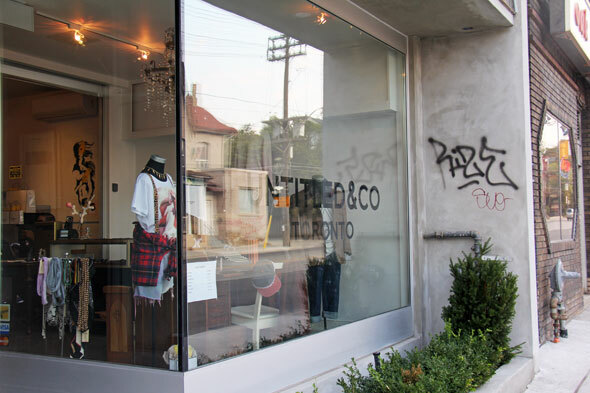 The store is the exclusive Toronto retailer of Fresh Train Co. and Pyramid Scheme , and of course, the store proprietary line of both new 100% cotton, locally-produced, and "100% gangster" T-shirts ($25), sweatshirts and hoodies, and re-worked vintage. Wilson previously designed restaurant T-shirts for places such as Gusto 101 . 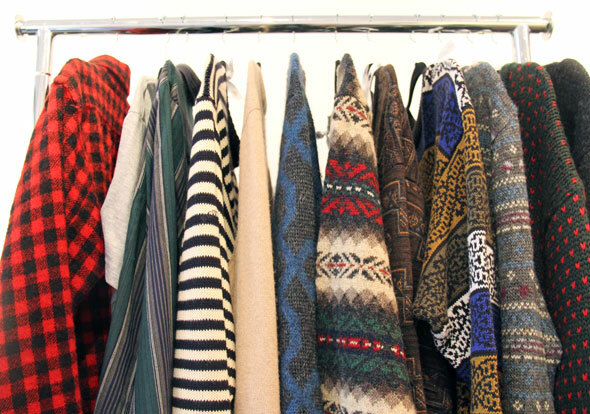 Under the store's significant vintage umbrella, you'll find the reworked designs of John Wolfe, thick vintage men's sweaters from Lacoste and "pre-Tom Ford Gucci," an outrageously printed "pre-racism John Galliano" shirt that may or may not be a pajama top, vintage Calvin Klein, and Untitled and Co's nicely reworked, studded, and tie-dyed denim. "Any douchebag with a Lamborghini can walk into Gucci and buy whatever they want, but noone can travel to the past," Wilson says. For women, there are new Wildfox sweaters (for a look that Wilson dubs "almost Fiorucci "), L.A-brand Mystery, and an array of altered, tailored, hand-dyed or, admittedly, otherwise improved vintage pieces. You'll also find a range of lingerie (with sets as low as $15) from the '40s to the '60s, pulled from his great-great-grandmother's collection of (and here, I need to stress) utterly unworn pieces. 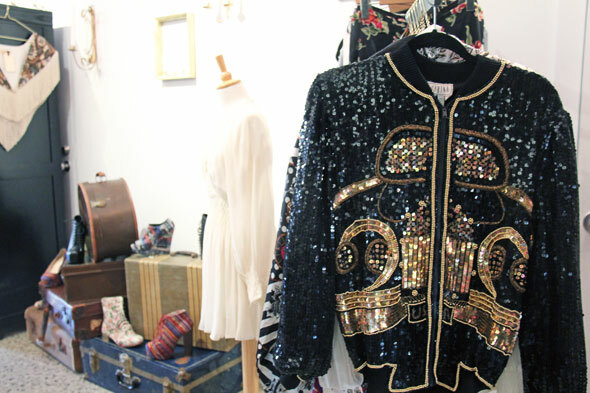 There are vintage dresses from Betsey Johnson and Marc Jacobs , vintage bags ($10), unbranded but fashion-forward shoes ($65-$75) ordered from L.A., and a fly-girl section with big, "badass" bomber jackets. 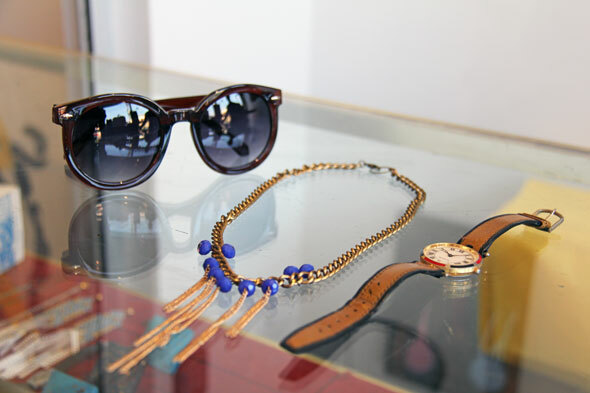 The jewellery and accessories in the store are a blend of vintage (with Wilson's penchant for religious iconography well-represented), and small Toronto brands, with watches for $10 (because no promises are made about their being in working order), and $10 unbranded sunglasses. A lone vintage Missoni pair with gold frames are $110, and you'll find looks from Toronto company del rey and co. , which makes $25 customizable sunglasses. "I aspire to get the kind of girls in here who aren't afraid of what people think--that's unattractive to me. It's meant to be fun and unapologetic," Wilson tells me. And to give credit to him, he introduces me to the truly spectacular Anna Dello Russo video for H&M --which in its outlandish sense of fun, is weirdly reminiscent of the store as a whole. 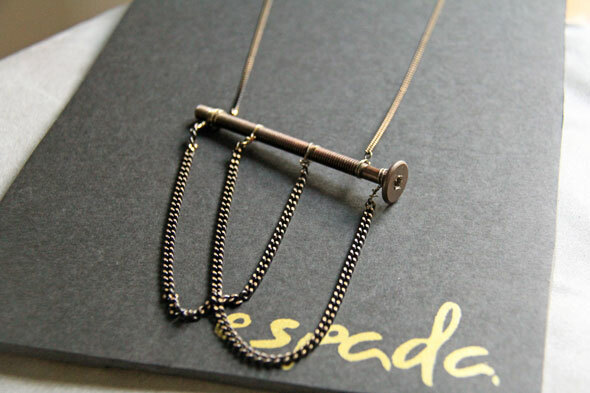 It has to be said that when I come back a mere hour or so later, he's just gotten in four necklaces from espada, the line of an 18-year-old girl and a clear wunderkind at that--my purchase is instant, and now, much-loved.